The HK Version was censored for its theatrical release. The uncensored HK Version was only released on DVD in France by HKV. Unfortunately, the HKV-DVD doesn’t contain an English audio track or English subtitles. The HK Version is distinctly different than any other versions released worldwide. The Export Version was released in several countries, mainly on VHS. In comparison to the HK Version, a lot of scenes are different in the Export Version. The US Version is pretty similar to the Export Version and was released on DVD by Artisan (obviously in the US). The German re-release on DVD by Kinowelt and presumably the DVDs in other countries are based on the master of the US DVD. That’s why the US Version is spread in several countries these days. In comparison to the Export Version, the US Version varies at the beginning and ending. As often when it comes to HK movies, a special extended Version of Black Mask was released in Taiwan. It seems as if that version is based on a workprint. It contains many additional plot scenes plus it’s completely uncensored. Moreover that version contains further action scenes and is the longest version worldwide. Furthermore it contains the original soundtrack with a lot of different tracks. In comparison to the Export Version, the Taiwanese Version only lacks a few shots and plot scenes. Disadvantage oft he Taiwanese Version is the bad DVD release that only contains DD2.0 sound plus it’s awfully letterboxed. The Taiwanese Version is OOP and only available on ebay. The next disadvantage is the subtitling: both the English and the Taiwanese subs aren’t optinal and can’t be switched off. Often their hard to read due to the white coloring and they could be on the screen for an extended period to make the reading more comfy. But that problem exists often on Asian DVDs. Nevertheless the Taiwanese Version is the most interesting Version but the Export Version and the US Version can be recommended as well. The Taiwan Version has been structured differently, especially at its beginning. As a result of that, it makes way more sense than the tightened Export Version. That’s not going to be mentioned in the actual comparison because it’s neither interesting nor clear. The comparison is reduced to mentioning any scenes missing in the Export Version, no matter where that scene pops up in the Taiwanese Version. For chronological reason, the comparison is oriented towards the International Version. To emphasize the actual censorship in the context with violence, those differences are marked in red. The time index refers to the Export Version represented by the German VHS (PAL). Time measurement started at the beginning of the movie without the logos in the calculation. Compared are the International Export Version , represented by the German VHS released from Starlight (not rated), and the Taiwan Extended Cut from the ThunderMedia DVD. The Taiwanese Version goes without summarizing the previous events. The International Version instead starts with a flashback of the neuretic surgery. But the missing flashback doesn’t imply the Taiwanese Version is cut, it has just been removed and shows up as Tsui Chick’s memory and is also longer. Before the beginning of the neuretic surgery, a sign which reads "Resection Neuropathy System" pops up. 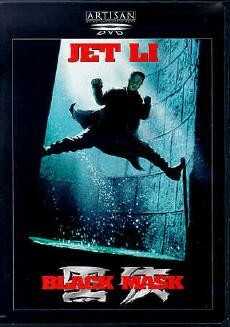 Jet Li butters a door while the female teammate is standing behind him. Then he opens the iron door. Extended conversation of Jet Li and the female teammate. Extended farewell scene before they hug: Li also says they only had an hour remaining and adds everyone was going to get killed if they didn’t leave. He tells Yuek-Lan to say goodbye to the team. Shot of the military area. Then Jet Li, he grabs a soldier and breaks his neck. Now a little introduction which explains that all members of the special forces unit „Squad 701“ had a neuretic surgery to not being able to feel pain anymore. Shot of a soldier whose arteries at the neck and arm burst open (why?). Now another introduction which explains that the experiment was categorized as failed and that the all team members were supposed to get killed. In the last sentence, it’s being mentioned that one the team members of Squad 701 was “Black Mask”. Black Mask (Jet Li) butters a door, a soldier’s voice is audible here. The team members of "Squad 701" get warned that they had just entered a military zone with no trespassing and they were going to get killed if they kept moving. Anyone should surrender and let themselves being escorted to the lab. Not really interesting, but for the sake of completeness: the credits are entirely different. First of all, the International Version lacks some names of the participants (as a result of that the rough cut when Li jumps in the box under the ceiling). Secondly, the credits in the Taiwanese Version are onscreen for an extended period. After "Black Mask" could escape through the door, the following writing is being displayed in the Taiwanese Version: "This person has been erased!" Before the shot of Li reading a book, the Taiwanese Version contains a shot of an apartment tower and the writing "Hong Kong". The International Version contains a shot of Hong Kong instead, which isn’t in the Taiwanese Version. First he sees Tracy from the distance, she’s sitting with the back to him. She starts weeping because she got dumped and hits with her fist on the table born out of frustration. Her boss arrives and tries to calm her down. She says it had been a new record this time because she’s gotten dumped even before she’d known his name that time. Li explains her name was Tracy and that she got the nickname “Trendy”. Another missing part of the scene in the International Version. One of the guys passes her sth. To drink and everyone tries to convince her that the guy who dumped her wasn’t the right one anyway. After her boss explained to Tracy that she needed the „guy next door“, the International Version lacks a shot of her putting the straw in her mouth. (In the International Version, the straw’s in her mouth immediately. First of all, Tracy isn’t thrilled by that idea at all but her colleagues try to talk her in. They try to make her clear she should have it with those cold guys etc. Tsui Chick wasn’t a drinker, a smoker or a gambler. When Tracy hears gambler, she wants to know how they knew he wasn’t. The boss calls for Tsui Chick and asks if he wanted to play Mahjong after work. Li tries to talk his way out by asking why his fellow doesn’t play with him, but it doesn’t work. Then he asks the boss why it had to be Mahjong and the boss replies a lot of money could be made. Li asks how much he could make on one evening, his colleague tells him he could make $300 to $500 if he was lucky. Tsui reaches for his consider it the money he’d lost. When Tracy sees Li wants to give the money to his boss, she interrupts and asks him why he wanted to give so much money away. After having made some excuses, Tsui leaves to assort further books. The others watch him leave and Tracy says that kind of men usually just exist in women’s imagination. Because of the force of the explosion, the drug lord is tossed into a corner. When he gets back up, one of his men is standing in front of him. The drug lord asks the man to protect him, but the man rams a syringe into the drug lord's stomach and tells him that he's not one of his men. Subsequently he contemptuously explains that by now they eliminated almost every drug lord. He equips a scalpel. After a close-up shot of the scalpel, the image blurs and the scene fades out. Tsui Chick flippantly asks his friend (Rock) whether or not he was working on the case of the drug dealers. Rock tells him that it's immaterial who is responsible for the case. In his opinion, everything would be better if the drug dealers were all dead. Tsui Chick responds that it's not right to fight against violence by also using violence. Tsui Chick makes another draw and says that he took the queen. Rock tries to explain his point of view by saying that it is too easy to be freed from prison as long as you can pay a good lawyer. Then it's Tsui Chick's turn again and after his draw he says "Checkmate!" - In the international version you hear him say "Checkmate!" from off-screen and during the next sequence. After Tsui defeated Rock in the chess game, he says that he could offer some help. Rock looks a little puzzled and then hits Tsui's eye with his fist. Horrified, Tsui asks him why he did that and Rock serenely replies that there was no particular reason. Tsui Chick at first can't really believe him, however, he breaks off the conversation and says that they should just go on playing. Rock is a little angry and asks Tsui if he never gets angry. Then he tells Tsui that in modern times he has to learn to defend himself. Just before he gets up to go to the toilet he says "I have to educate you". The camera pans along several toilet cabins and stops at one of them which is currently taken. Then follows a cut to Tsui Chick's friend who apparently has some problems while taking a crap. Tsui Chick washes his hands when he suddenly recognizes his friend's watch lying on the sink. He turns around and reminds his friend not to forget the watch. Before the scene even starts, the Taiwan version shows Rock going to his motorcycle. Someone informs him by phone about everything that happened. Rock can't believe that they cut the drug lord's chest open, implanted a bomb and then sewed him up again. Tsui Chick overhears the whole conversation and suddenly seems to remember something. Before Rock and some doctors look at the radiographs of the implanted bomb, the international version is missing out on an exterior view of the hospital. The men wearing the protective suits discuss who should leave the room and who's supposed to stay. Meanwhile, the beeping sound of the bomb is gettign faster and the heart rate decreases. After the bomb exploded, the Taiwan version shortly fades to black before you see Rock getting up. Rock asks Tsui Chick if he wants to work for him. All the time they're being watched by Tracy and the boss. The boss tells Tracy that Rock is dark and ugly and that he can't understand why she favors him. (...the colleagues actually assume that Tsui Chick is homosexual. After this scene Tracy in the Taiwan version finally grabs the book to throw it at Rock). The scene in which Tsui Chick is checking his body functions with sensors and appliances is cut differently. The Taiwanese Version shows more (e.g. the ECG in a close-up and the numbers on the monitors measuring the body functions) but is nonetheless shorter because the International shows Jet Li lying longer. A sparsely dressed woman is dancing on a table, then King Kau approaches her and touches her behind. He is laughing crazily. Yuek-Lan, hanging from the ceiling, can be seen as well. She tries to get free. In the meantime, King Kau is fetching a water gun which is connected to electricity and is shooting at the dancing woman, who is whimpering a bit. Kig Kau then takes a neon lamp and throws it against the wall. Before King Kau goes to Rock the two look at each other and gesticulate, e.g. King Kau is pointing at Rock's head wound. King Kau mockingly screams salutations towards Rock, who is not amused about that. The flashback of Tsui Chick saving the woman's life is shown in slow motion in the International Version, the audio (except the new soundtrack) is missing as well. The Taiwanese Cut shows the scene faster and features audio as well: The woman thanks Tsui Chick and he answers that he might not be able to save her next time. Unfortunately, this scene is positioned rather strangely in the Taiwanese Version. Long after the woman is not hanging from the ceiling anymore, she is up there again and remembers this? The International Version is more logical. The flashback is shown after the woman sees the Coach (Jet Li). The head of the police is talking longer. He tells Rock again not to wear such an outfit (the “Black Mask” costume) anymore. After he left, a colleague is saying to Rock that someone was looking for him. The Taiwanese Version features a short shot of Rock and Yuek-Lan walking towards Tsui-Chick. The latter is pickung up the pidgin which he will release in a moment (also contained in the International Version). A shot of Rock turning away in order to let them have some privacy is missing before they hug. The Taiwanese Version shows Tsui writing something before Tracy calls him. He is saying something from the off. 701 reappeared in Hong Kong and they were going to to to him soon. Then the telephone rings. The television shows more interviews and opinions of citizens about the mysterious “Black Mask” - A woman who is not very happy about it and a psychologists thinking he was an illusion. Tsui Chick (dressed as Black Mask) is not very happy about Tracy's idea that he could star in a movie. He tells her that women were very superficial etc. She reminds him of the fact that he was the one wearing a mask. Tsui Chick answers that women are wearing make-up and that that was the same. Tracy quietly says that she is not wearing make-up. Tsui puts some cosmetics on the table. - She is happy and instantly starts putting on lipstick. After Tracy remembers that she does not even know what has happened to Tsui Chick a scene follows in which he is calling her. Tracy is looking for her ringing phone and is relieved when it is Tsui Chick calling her. She tells him she was kidnapped and suspects to be in some industrial complex. Tsui, still wearing the costume, can be seen on a roof. Tracy urges him to do something and contact Rock, but he keeps the talk brief and ends it. She is a bit offended and stamps on the ground. When the (thought to be) las team member of 701 gets up and attacks the two policemen, he grabs their hands. A short shot of him twisting the policemen's arms so they break is missing. A shot of him and the screaming policemen follows. The following shot of the police squad starting to move is missing as well. The assassin is pushing the scalpel into one of the two policemen's head. The International Version only shows him pushing the head of the policeman down and taking the scalpel of him, the sight of him hiting the policeman was removed! The guy is being hit longer first, including some cuts to the firing policemen. After some hits two bullets enter his forehead, which cannot be seen in the International Version. The sign "Intensive Care Unit" is shown longer in the Taiwanese Version. After the bald member of Squad 701 got up, the special forces unit kicks in the door and fires some bullets at him. During this sequence, the first few hits as well as a countershot to the special forces unit were cut away. Then, the man returns fire. A man chokes Rock - therefore, the latter punches his ribs with his ellbow (you see some more hits than in the international version). During this scene you see the counter of the bomb which is carried by the guy who chokes Rock. The two of them wrestle some more in front of the window before Rock's men enter the room. She tells him that they soon will have a lot of money and are then able to change her operation back. To help Tsui Chick (who's seriously injured) Tracy steals som banked blood from the hospital. The international version is missing out on the shot where she walks back and forth in front of the locker with all the banked blood. In the end, she opens the locker. A short missing shot on the van which Tsui Chick uses to cure. After Tsui Chick woke up inside the van and apparently seems to feel better follows a scene where Tracy (outside in front of the van) shoots some bottles with a nailgun. When she turns around, Tsui Chick is standing behind her and with shock she starts to scream. he just asks her if she really wants to help him. She nods. He says that she should get ready, since there are more things to do. Tracy laughs (obviously happy about him accepting her help) and hands him the nailgun. Then she leaves the screen. At the end of the scene there's a long shot of Tsui Chick who soliloquizes: "It's time to put an end here." Tsui Chick and Tracy hot-wire a car. At the end it doesn't really work but then finally the engine starts. Tsui Chick also picks up a gas bottle and uses it to beat Hang up. Then he throws the bottle at Hang's chest with full force and takes the opportunity and attempts to escape. He tries to smash the door's glass.